When a craving for home-style cooking strikes your savory senses, head to Hash House a Go Go for a hearty down home over-the-top meal. Located in the Linq Casino, this award winning eatery offers a creative menu, large portions and farm fresh food with a Vegas twist. 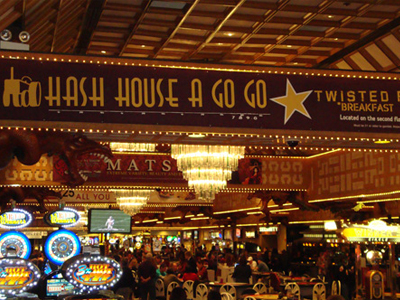 Feast on a bountiful breakfast or a colossal salad at lunch, while enjoying the comfort foods Hash House has to offer. Hash House A Go Go has been named Best Breakfast, Best Brunch, Best Sandwich and numerous other accolades, and it’s been profiled by Martha Stewart, Dr. Phil, Rachael Ray and more. Try the restaurant’s signature one-pound burger stuffed with bacon and mashed potatoes! The food was amazing and cheap! The bartender RJ was great. Made great drinks! I had breakfast here early in the morning on December 3, 2015 it was two eggs, 2 slices of bacon, and two huge pancakes. I’m talking really huge pancakes. I have a big appetite and I could only eat a little more than half of it. I told the bartender it needs to be less pancake and more bacon. It was good but kind of expensive I wouldn’t go out of my way to go here again like I did this time. I’m giving it three stars. The best place to eat. Wow!!! Love this place. The price is great. It’s a lot of food. Can’t wait to go back. All I have to say is the food is so good. Huge portion great prices.. Love it.. This place is great! The food is huge. (Man vs. food huge) Has some of the best Bloody Mary’s around. I sampled three dishes, mine and tasted my buddies. All were unbelievable. I can’t wait to go back.